Being completely natural and fully biocompatible, this system can be used with other bio-entities for their sensing based on the proposed laser. Being very robust and highly reliable, this ‘kitchen laser’ has very good and linear response for temperature which could be used for temperature sensing too. Lasers are ubiquitous sources of light with extraordinary properties such as high degree of directionality and sharpness. They are indispensable in a dazzling range of products and technologies including communication, lithography, medicine, military operations, scientific research, engineering, displays, and data storage. In this case, a particular class of lasers called ‘random lasers’ have been demonstrated in carrots where a Raman process plays a central role along with the cellulose network. 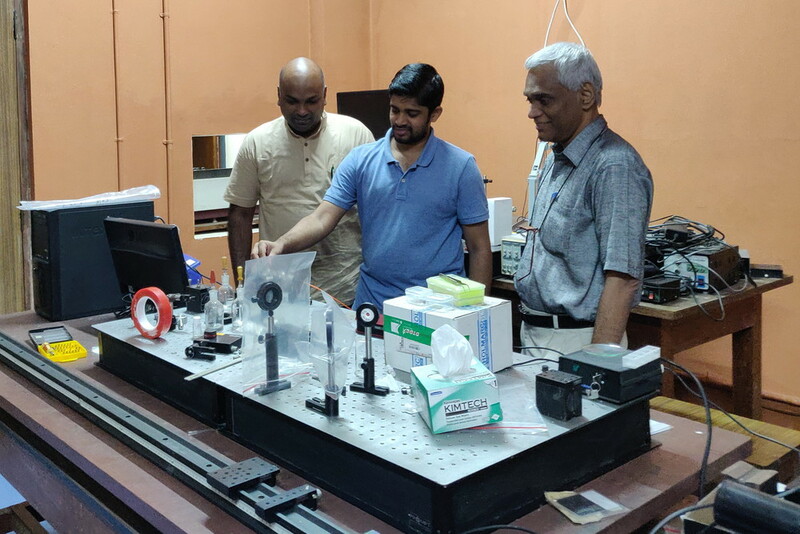 The Research was undertaken by a team comprising Prof. C. Vijayan, Physics Department, IIT Madras and Dr. Sivarama Krishnan, Assistant Professor, Physics Department, IIT Madras, along with Mr. Venkata Siva Gummaluri, Ph.D. Research Scholar, Physics department, IIT Madras. The Salient Features of this Research include:  Natural and fully biocompatible system.  Easy and safe to handle and use.  Robust and highly reliable since the lasing mode is fixed at specific wavelength by Raman vibrational mode.  Temperature sensitivity of lasing mode suggesting potential sensing. Light Amplification by Stimulated Emission of Radiation, more commonly known as LASER, is one of the most important discoveries of the 20th century, as has been shown by its plethora of exciting applications in daily life. Laser is created when electrons in some special materials absorb energy and become ‘excited.’ These electrons emit ‘particles of light’ or photons when they return to their original state. The photons are coherent, which makes the light emitted powerful and sharp. These lasing materials are usually solid-state and semiconductor materials, such as Nd-YAG, which are expensive, and involve environmental issues during production and/or use. Mr. Gummaluri, the Ph.D. student, said, “We were excited to see lasing in fresh carrots, due to the carotene and cellulose found in them. We have successfully demonstrated CW-laser pumped stable Stokes mode random lasing, exploiting the Raman activity of naturally occurring carotene and multiple scattering due to cellulose in carrots.” Since biocompatibility and sustainability point to bio-derived materials, the team looked at biological molecules as probable lasing sources. Organic chemical based lasing sources have been around for decades, nearly as long as semiconductor sources. Random Lasers (RL), for example, have traditionally use plasmonic/dielectric scatterers, and gain media such as chemical dyes and fluorescent polymers. While the traditional polymers used were toxic and non-biodegradable, there has been search for more eco-friendly fluorescent polymers. Cellulose fibers for example, have been shown to facilitate multiple scattering of phonons, suggesting possibility of an organic/eco-friendly bio-compatible scattering medium. This work published in the leading journal of the Optical Society of America, Optics Letters, was chosen as the Editor’s Pick of the issue (Optics Letters', page in Vol 42, page 5002 (2017) and Vol 43, page 5865 (2018)). Carrots, in addition to having carotenoids, also have cellulose fibers, that contribute to multiple scattering of photons and resultant optical amplification for Raman random lasing. They were not wrong in their expectation.